Changes in federal and Massachusetts state laws now require insurance payment for addiction treatment, attracting potentially disruptive for-profit providers to a fragile market. Eight high-profile Silicon Valley women have formed the nonprofit Project Include to demand less talk and more action on diversity from the tech sector. Six nonprofit hospitals owned by the Daughters of Charity may become the property of a New York-based venture capital group under a deal recently given conditional approval by California Attorney General Kamala Harris. Contest Philanthropy Mutates—Can It Be Made to Fit? 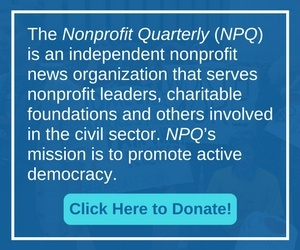 It’s no secret that NPQ is not a big fan of contest philanthropy, but we are appreciative of taking the best of an overall abominable idea and using it for good. Ellen Pao lost her gender discrimination case against VC firm Kleiner Perkins, but she brought the question of gender discrimination in the Silicon Valley high-tech sector to the public’s attention—and it’s not going to go away.